In large bowl, mix butter and 1/2 cup sugar until well blended. Stir in almond extract and 1 egg. Stir in flour and salt until well mixed. Cover; refrigerate 1 hour if necessary for easier handling. Divide crust dough into 4 pieces; divide each into 12 pieces. Roll each piece into ball. Place 1 ball in each of 48 ungreased miniature muffin cups; press in bottom and up sides of each cup. Spoon about 1 teaspoon filling into each cup. 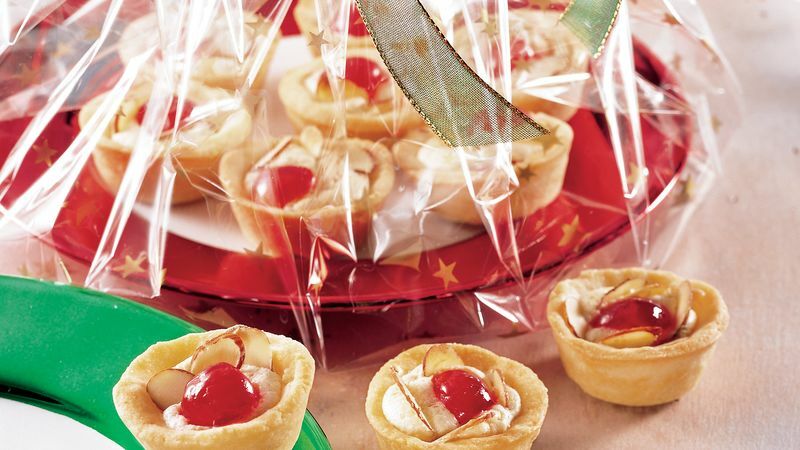 Sprinkle or arrange several almond slices and 1 cherry half on top of each cookie. Bake 17 to 22 minutes or until centers are puffed and edges are light golden brown. Cool in pans 5 minutes. With tip of knife, lift cookies from cups. Cool completely, about 10 minutes.